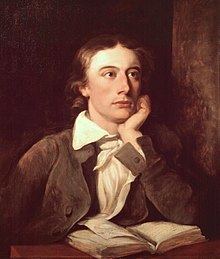 John Keats (/ˈkiːts/; 31 October 1795 – 23 Februar 1821) wis an Inglis Romantic poet. He wis ane o the main feegurs o the seicont generation o Romantic poets, alang wi Laird Byron an Percy Bysshe Shelley, despite his wark haein been in publication for anly fower years afore his daith. This page wis last eeditit on 26 Mairch 2017, at 03:49.